In my long experience as an avid gardener, I've always appreciated the ready availability of reliable garden tools. It is quite frustrating to search for garden tools for half the time while in the garden. Equally irritating is to realize that the found garden tool isn't working as expected for some reason, e.g., jammed, rusty or dirty. Gardening is supposed to be an enjoyable and relaxing experience and so I avoid getting into this situation especially on a daily basis. That's right. Everyday, it has been my early morning ritual to deadhead plants whether for spent blooms or unwanted shoots. Although deadheading can be done manually, I prefer to use a pair of garden pruning scissors. Shown above are the blades of garden pruning scissors after a deadheading session. Notice the leftover trimmings and clear sap on the delicate blades. That dripping sap will quickly collect dirt and debris when allowed to dry and then continually reusing the scissors thereafter. This could gum up the blades and will require you to clean it the way I clean my garden pruning shears, which typically work harder (pruning thicker branches and stems) in the garden. 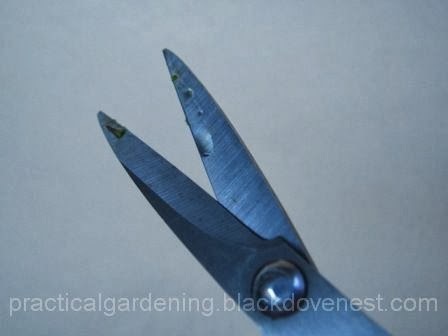 So in my daily morning ritual, I've devised a very simple and quick cleaning routine on the garden pruning scissors right after my deadheading session. This ensures I always have a ready and reliable gardening tool the next time I need it - usually the following morning. The trick here is to apply the KISS principle or Keep It Simple, Sweetheart. Keeping the routine simple makes you want to do it consistently because it's so quick and easy! Prepare a small rag. A small piece torn off an old discarded cotton t-shirt is enough. This what you'll use to wipe clean the garden pruning scissors. You only need to do this step as needed. Throw the rag away and replace it once it's too dirty to reuse. Spray a liberal amount of lubricant like WD-40 on the blades of a clean pair of garden pruning scissors. Spread the lubricant on all surfaces of the blades with your finger. Gently wipe off the lubricant with the rag, letting the lubricant soak into it. There's no need to wipe the scissors dry. A bit of lubricant coating left on the garden scissors is fine. Put the rag in a place where you will pass by when storing away the garden pruning scissors. I put my rag in a corner outside of a window because this is where I always pass by when going back in the house. Alternately, you can put it near where you store the scissors. Put the garden scissors in a plastic case (if available) and store it in a safe place such as a rack, drawer or cabinet shelf. The garden pruning scissors is now ready for everyday use. After every pruning or deadheading session, get the cleaning rag and hold one of the scissors handle. With the other hand holding the rag, wipe off the sap and debris on the blade along the length of the held handle. Wipe in a direction AWAY from the scissors' joint or fulcrum. This is indicated by the yellow arrow in the photo below. Wiping the blade in the opposite direction (towards the joint) may push sap and dirt into the garden pruning scissors' joint - and these may be harder to remove. Repeat the previous 2 steps for the opposite handle and blade. Shake off any loose debris from the rag and return to its storage. Return the garden pruning scissors to its storage. If your scissors has plastic handles, avoid holding on to the plastic handle when cleaning the blade, as shown below. Instead, hold on to the scissors metal part that is closer to the scissors' joint as discussed previously. Do advise your family members to refrain from using the the gardening tool for other purposes like cutting thick cardboard, carton, etc. This will quickly blunt the cutting blades of the garden pruning scissors.